A family run business, offering a 24 hour drain clearance and all aspects of drainage works. We cover Devon and Cornwall. Blocked drains in Plymouth Blocked drains in Tavistock. Blocked drains in Launceston. Blocked drains in Liskeard. Blocked Toilet in Tavistock, Blocked toilet in Callington, Blocked toilet in Launceston, Blocked toilet in Plymouth. With 26 years experience in the drainage industry, you can trust Walkhampton Drainage Company to offer a professional service. We offer services to the domestic and commercial properties with jetting, CCTV and drainage repairs and installations..
We carry out percolation tests, construct soakaways and install drainage systems working to the British Code of Practise. We are insurance work approved contractors and all of our work is fully guaranteed. 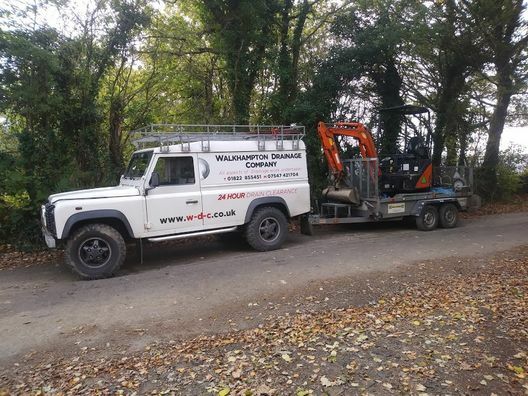 Walkhampton Drainage Company is very proud of our positive approach towards our work and employs consistently high levels of workmanship throughout. Walkhampton Drainage Company engineers are all trained to City and Guilds levels both in the water jetting industry and confined space working industry. Being a family run business, we understand the importance of punctuality and courteousness in a service, which is why we pay great attention towards customer care striving for the optimum results every time, whether you require domestic, commercial or industrial work. Blocked drains in Tavistock, Plymouth, Yelverton, Liskeard and Launceston. As you can see we don't just offer a drain and sewer cleaning service. We can clear toilets, sinks, baths and showers basically any pipe that is blocked. If it can't be cleared because of damage we can repair this as well. No job is too big or too small that we will not take on with focus and determination. Emergency ground works and drainage repair service. What Should I Check if I'm Buying a Property Served by a Septic Tank? 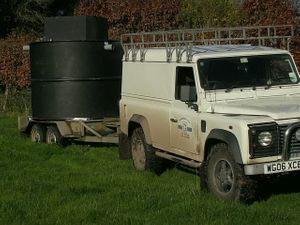 Do you have evidence that the tank has been maintained and regularly de-sludged? Is the septic tank in good structural order and is there any history of problems? Is the soakaway functioning properly? Is there any evidence of flooding or pollution? Has SEPA approved any discharge to a stream? As your building society or bank valuation report is unlikely to cover these aspects adequately we would advise you to arrange a site inspection which includes the drains, the septic tank and the soakaway which can be carried out by a competent surveyor. We cover the blocked toilet, sink, the bath and shower, right through to your main drains, we do it all. Whether it's just blocked or a problem with your drainage system we can sort it for you. So for blocked drains in Yelverton give Walkhampton Drainage Company a call.